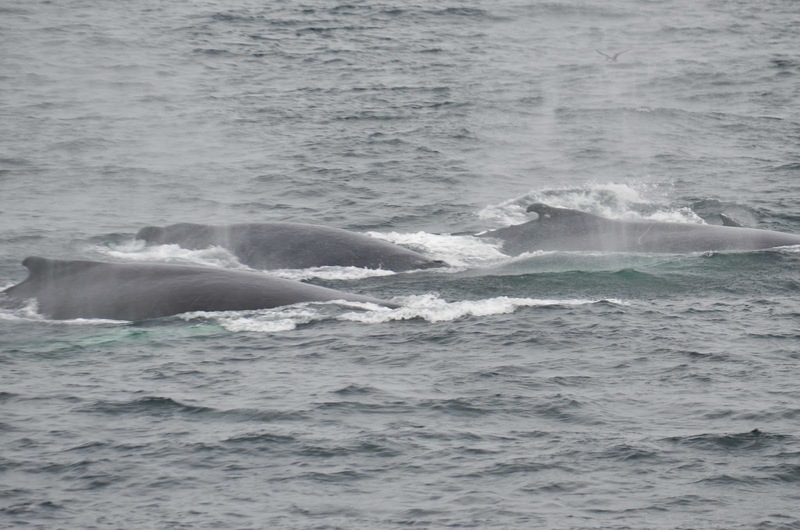 The northwest corner of Stellwagen Bank was teeming with whales on our 10am whale watch! There were four different mother and calf pairs including Milkweed, Canopy, Perseid, Nile and each of their calves! We also saw Bayou, Cajun Aerospace and Draco. These whales were separated into three different groups that periodically joined, separated and swapped individuals. They were definitely doing some subsurface feeding as they’d all dive at once followed by a synchronized surfacing. Meanwhile, the calves milled at the surface sometimes joining in on the dives. 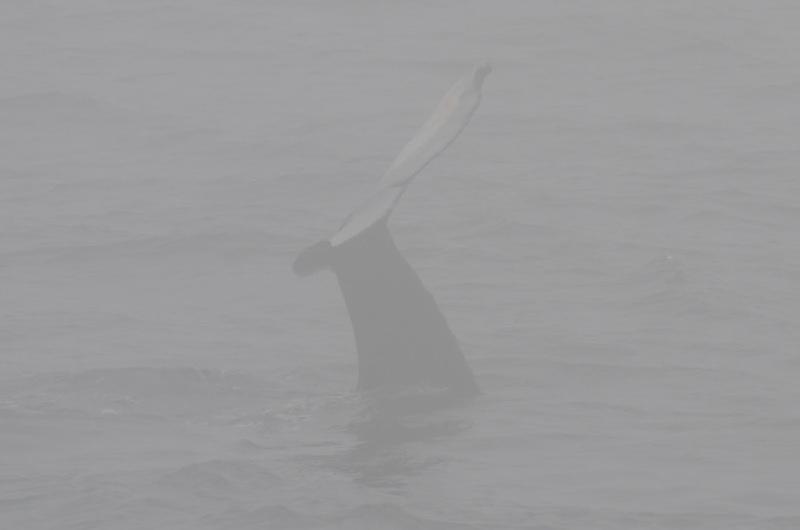 As our whale watch progressed, a thick fog rolled in. Most of these whales stayed very close by our boat swimming in and out of visibility. We were lucky to watch Nile’s calf just about the entire trip who was doing a series of repeated tail breaches and creating enormous splashes! The young calf put on quite a show! 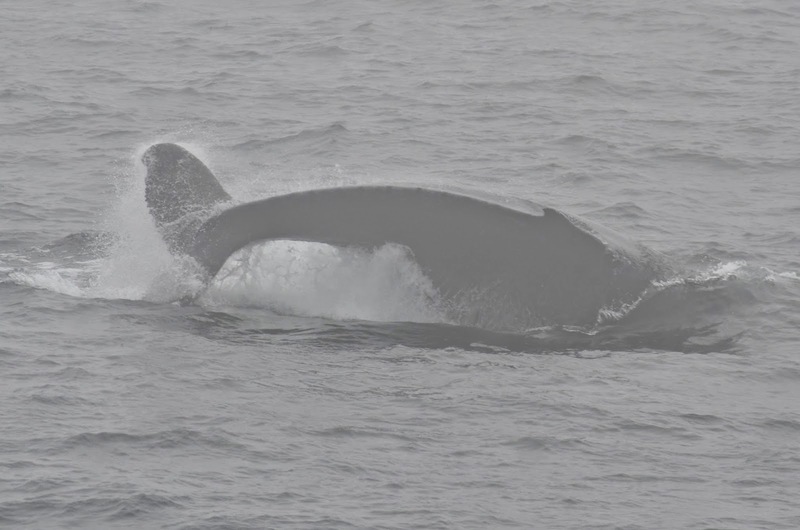 Today on board Aurora for the 12pm whale watch, we traveled to the northwest corner of Stellwagen bank. About 15 minutes shy of the bank, we ran into a huge fog bank. That made the next 45 minutes of searching for whales very difficult because we could only see about 100 feet off the bow. Luckily Captain Chip persisted in the pursuit of whales, and finally we spotted a calf. Not much further past the calf, a large group of humpbacks surfaced. It was difficult to ID the individuals but after some time with them we found out who they were. In the area was Nile and calf, Milkweed and calf, Perseid and calf, Canopy and calf, Draco, Bayou, Cajun, and Aerospace. They were taking short dives and changing direction multiple times, probably doing some deep feeding. — Hannah P. and Kira L.